The legend is bound up in actual events of 1961 and possibly blended with another multi-vehicle wreck in the mid to late 1970’s that resulted in multiple casualties. As the scene of the original screaming bridge changed, then became inaccessible, the story attached itself to another nearby bridge. Numerous websites and paranormal investigators have chronicled the search for spirits at the site and continue to offer tours of cemeteries and nearby landmarks. Every new generation of local youth are exposed to the legend and many seek to hear “the screams of the girls” for themselves. On the night of February 4th, 1961 a car filled with six Arlington teenage girls plunged off a burned out wooden bridge where then Arlington-Bedford Road (renamed Greenbelt Rd) approached the railroad tracks in far North Arlington. The tracks themselves run parallel to a drainage ditch (mistakenly reported to be a creek in various newspaper articles of that time) which the bridge spanned. The Arlington High School coeds were out joyriding after leaving a movie that evening. As the girls’ car approached the crossing at approximately 45 mph, the incline of Arlington-Bedford Rd. and darkness prevented them from seeing the bridge was out. At 9:30 pm their vehicle left the road and impacted the other side of the ravine (which sloped up to the old Rock Island Railroad track) landing upside down. Instantly killed were Mary Lou Goldner, 16, and Claudie Jean Reeves, 17. By 2am Sunday morning Kathy Fleming arrived dead on arrival at Baylor Hospital bring the total deaths to three. Injured were Donna Post, Dorothy Ibsen, and Jo Ann Anderson with multiple fractures (arms, jaws) and concussions. Jo Ann Anderson remained in critical condition after undergoing emergency brain surgery that Sunday morning. Newspaper articles of February 6th (headlined “Death Bridge Involved in Probe”) reveal that another youth, Bill Young, had slowed for a train crossing the road just beyond the bridge over the ditch and noticed the bridge was out, stopping just three feet shy of the ravine. He had narrowly missed plunging off the road himself and tried to warn the girls’ vehicle by honking his horn while he was backing up. It is thought his warning may have frightened the driver (into speeding up to pass his vehicle, contributing to their speed when they left the road. It was this witness who notified authorities of the accident. County Fire Marshal Mason Lankford began an investigation that confirmed his suspicions of arson. Best possibilities according to Fire Marshal Lankford and Euless police chief W. M. Sustaire were either “young vandals” or “hobos”. The bridge had been previously burned and repaired two years before. Barricades had been positioned on both sides of the road approaching the railroad tracks but were mysteriously missing the night of the accident. No answer was ever found regarding who might have removed the wooden barricades. They were installed after road flares (smudge pots) kept being extinguished or stolen. Although the location had already earned the name “Death Crossing” from earlier auto and train wrecks in the previous decades, Arlington Police Chief Ott Cribbs said the triple fatality had no parallels in Arlington history. Newspaper articles detailed the funeral arrangements as well as the impact upon friends and fellow students at Arlington High School. The father of one of the girls who survived (Donna Post) was interviewed in a subsequent article expressing no malice toward those eventually connected with the burned bridge. This was the first news account that detailed Marilou Goldner was the driver. One of the girls had never been down the undulating road and her friends were letting her experience the wavy road at speed before returning home from the movies. Ironically one of the girls who perished, Claudia Reeves was the daughter of a highway patrolman and investigating officers suspended their work to attend her funeral. Upon returning to their inquiry they were able to determine the identities of those responsible for burning the bridge. Four Arlington High School boys, Clinton Veres, Tracy Stanley, Ronald Max Moore, and Richard Truett Rivers were indicted and brought before a Grand Jury which declined to bring charges as reported on February 17th. The boy’s attorneys, Ronald Aultman and Byron Matthews, said their clients were driving on Arlington-Bedford road on Jan 27th 1961 (a night of heavy snowfall) when they stopped at the bridge over the drainage ditch. One suggested setting fire to the bridge; some say in order to impede the travel of the predominantly black community of Mosier Valley into north Arlington. After testimony from the boys, parents, and “leading citizens of Arlington” defining them as “good students and religious” the jury foreman declared their actions to be childish pranks and wished to give the boys (who had withdrawn from school before the hearing) a “new chance in life”. The grand jury asked the Tarrant County Commissioners Court to post rewards for information on the removal of the barricades from the bridge prior to the accident, which had occurred numerous times. Further investigations never revealed who was responsible for removing the barricades and road flares from the burned out bridge. No one ever stepped forward with information and the reward was never claimed. The wooden bridge was not replaced. Remnants of the bridge were bulldozed and then covered with large concrete drainage tunnels. These were covered in asphalt up to the level of the original span and this served to span the drainage ditch until another fatal accident involving two women and a train at the crossing. On March 10 1994 Rayelynn Jonston, and Tammy Lynn Dodson tried to outrace an oncoming train which impacted the passenger side of their truck. One of the occupants was knocked out of the vehicle while the other remained trapped in the burning vehicle. Both women died at the scene of the accident. After the 1994 accident this stretch of what was now known as Greenbelt Rd. was closed to all traffic. With its closing, the myth of Screaming Bridge moved to a nearby bridge spanning the Trinity River at the end of an abandoned road (Trammel Davis) which parallels the river. This closed and barricaded bridge has been featured in some stories and online videos as being the location of Screaming Bridge. It lends itself to investigations due to still existing as a bridge and may have been the site of a multi fatality accident in the 1970’s (under investigation at present time) but it is not the location of the original screaming bridge. 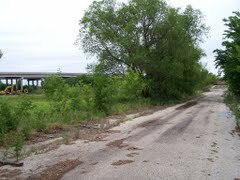 Recent construction and expansion of Trinity Blvd has obliterate much of the original road but the closed off section leading to the original site of “screaming bridge” remains. 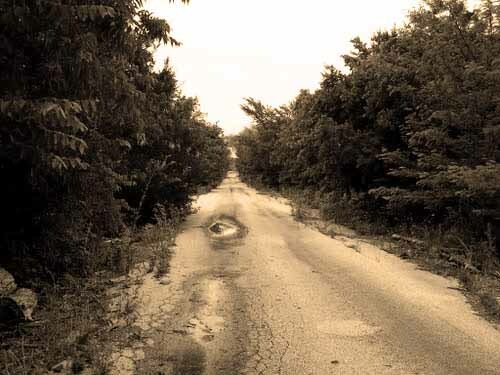 No traffic travels this stretch of declining pavement previously known as “death crossing” and more recently as “screaming bridge” but this isolated location in Arlington Texas continues to fire the imagination and draw the curious to this infamous North Texas location.